Welcome to Hostal Barcelona! The Guesthouse has 57 rooms with bathroom, TV, heating and air conditioning. It was completely rebuilt and has single, double and triple rooms. We offer daily cleaning service of rooms and common areas until 2 p.m. Hot water 24 hours. 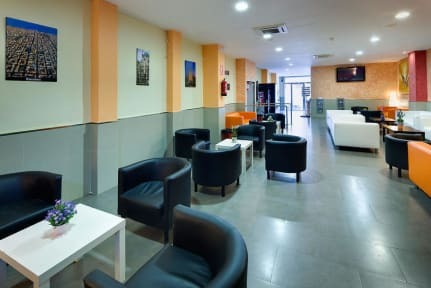 You can find breakfast buffet from 8 to 11 a.m. (extra charge of 4.50 euros per person) and service of cold and hot drinks and pastries 24 hours. Information about Barcelona, city maps, rent a car and safe deposit boxes are available at the reception desk. Free wire-less. TV room. The Guesthouse is located at number 40 of Roser Street, very near of Paral.lel Avenue, in the area of the theatres. 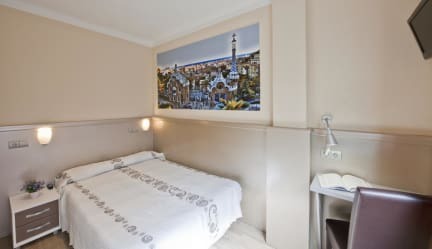 It is located 15 minutes by foot to Las Ramblas (city centre), the port and Plaa Espanya (where trade fairs are held). You can get around Barcelona by underground (which we call metro) 100 metres from the property, with lines 2 and 3. The nearest metro station is Paral.lel, way out called Ronda San Pau-Fontrodona. There are also many bus lines nearby, at Paral.lel Avenue. English, French and Italian spoken.